The heart’s simplicity refers to, in the context of spiritual life, the simple love of the heart for Krishna, the uncomplicated faith that just by learning to love him, we can overcome all obstacles and attain life’s supreme perfection. The head’s complexity refers to its tendency to not think straight, but to twist itself into detours and circles with many doubts and questions. The head is complicated due to our past conditionings as well as present circumstances, living as we do in a doubt-inducing culture. Some of us may find complexity tiring, while others may find the absence of complexity boring. Of course, the level of the head’s complexity varies from person to person. While some of us may find complexity tiring, others may find the absence of complexity boring. If our mind craves for complexity, we can’t just wish away that craving. Ultimately, it will be transcended when we persevere in our bhakti practice and experience that devotion, its simplicity notwithstanding, is genuinely sweet. But till then, due to the head’s inclination for intellectuality, we may find ourselves wondering whether bhakti is too simple and whether the path to the absolute truth can be so intellectually unstimulating. Significantly however, bhakti, though simple in its essence, is by no means superficial or lacking intellectual depth. A serious study of bhakti philosophy, as revealed in scripture and explained by erudite devotees, introduces us to bhakti’s subtlety and profundity. Mining into the many levels of the glories of bhakti – and of the goal of bhakti, Krishna – is life’s most intellectually fulfilling endeavor. And it is devotionally energizing too, for it increases our inspiration to love and serve Krishna. 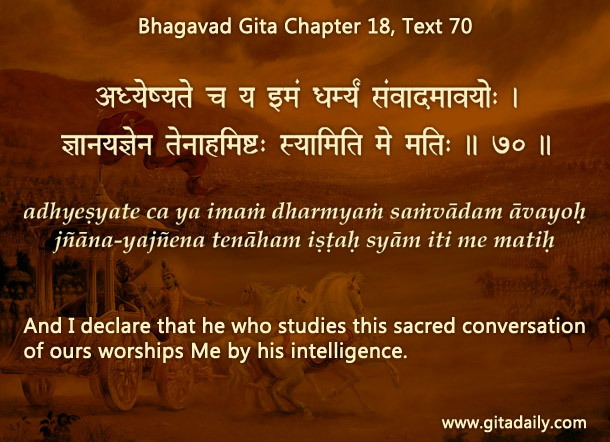 Pertinently, Krishna declares in the Bhagavad-gita (18.70) that studying his message is intellectual worship of him. By scripturally directing the head’s need for complexity towards bhakti’s profundity, we can realize that devotion for Krishna, though simple, is supremely sublime.